As the sprawling saga created by author George R.R. Martin and brought to screens worldwide by writer/producers David Benioff and D. B. Weiss comes to a close with its final, eighth season, nothing better than to go back to the beginning. The journey of the iconic series is spread out over ten years and eight seasons, which the HFPA has followed very closely. From unknown quantity to HBO’s most successful series ever -spectacular viewership worldwide, six Golden Globe nominations and one win, for Peter Dinklage, best supporting actor/TV- Game of Thrones established a new benchmark in TV production and put the fantasy genre right on the forefront. As we say goodbye to Westeros and Essos, we look back at the series through the eyes of its creators and actors and what they told us in dozens of interviews. In Part I of this four-part feature, the series has just launched, and the brutal universe of Westeros has been unleashed all over the world. London, May 2011 – Los Angeles, March 2012. George R. R. Martin, author: I love fantasy, I’ve read Tolkien and all that. But I also read a lot of history and a lot of historical fiction. I wanted to merge some of the traditions of fantasy with those of historical fiction. That sort of grittier, more realistic kind of feeling. Although Westeros doesn’t exist, I wanted it to feel like the real Middle Ages and so I tried to be true to what life was like in that period. A lot of fantasy isn’t - it’s like the Disneyland middle ages. 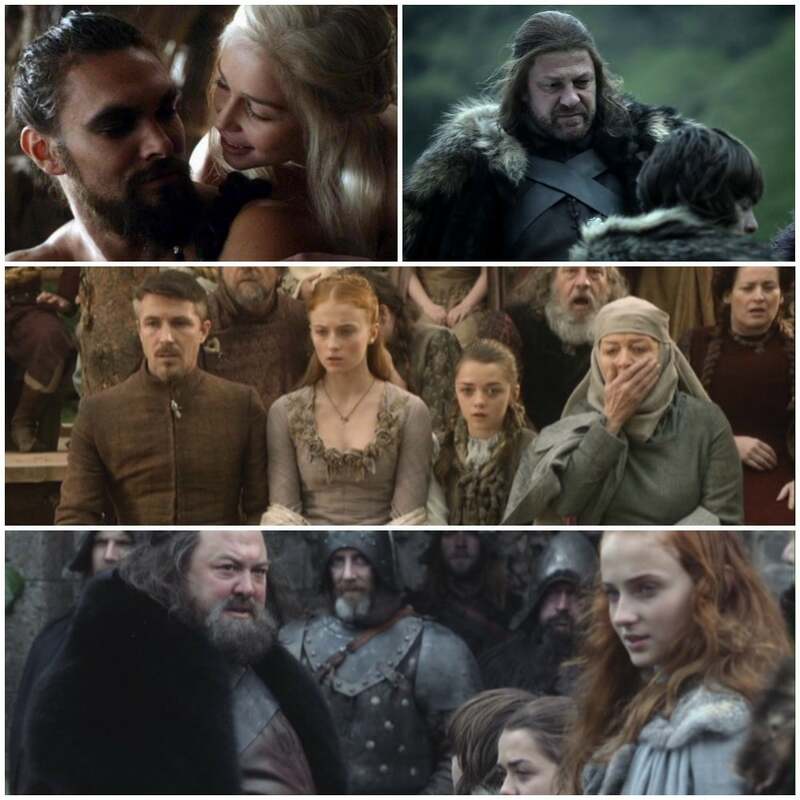 David Benioff, series creator/executive producer: We pitched the show (to HBO) in March of 2006 and one of the things we talked about then was that it’s not an American show. I mean, we think this is going to have a feel around the world. .(…) Just looking at Lord of the Rings and how well it did all over the world, it just feels like fantasy has an appeal that crosses all borders and it’s just a universal story. There’s something kind of very classical about it. We always felt like if we did it right it wouldn’t be just for the States. D. B. Weiss, series creator/executive producer: We gave (HBO) the pilot and a very detailed outline for the (first) season. And it was after reading maybe a 40, 45-page document they decided that this would be a series. George R.R. Martin: David and Dan love the books and are very intent on bringing my story to the television screen and to viewers. There are differences from the way I imagined it, but that’s inevitable in the process. I had an advantage because of my own experience in Hollywood. I was out here for ten years working on a couple of TV shows. I saw the process from the other side. D.B. Weiss: We were shooting in Northern Ireland and (Starz TV series) Camelot was shooting in Southern Ireland and we may have fought over some crew and it’s like we stole their DP or vice-versa. Jamie Campbell Bower who was in Camelot was in our show and he got killed in the first 5 minutes of our shoot, originally. I liked him very much, he was a very good actor. Sean Bean, Eddard "Ned" Stark: I wasn’t aware of the books. I met with Dan and David and they’ve given me the scripts and I just found it fascinating. Something very unusual that I had not seen before. Mark Addy, King Robert Baratheon: I started reading the books before I met (Dan and David) so I had more of an idea of what Robert was about. He’s not just generally grumpy, there are things that are constantly gnawing away at him. Emilia Clarke, Daenerys Targaryen: (Daenerys’) strength was just one of the biggest things that attracted me to her. As a young woman, to be able to see the journey of that woman, what she goes through in life, to see that in a TV series was just incredible, absolutely incredible. Lords and ladies of Westeros. Clockwise, from left: Sean Bean, Emilia Clarke, Mark Addy. George R. R. Martin: My favorite character is Tyrion. From the first, he has been the character who’s probably most engaged me. I love them all, even the ones who might be considered evil or flawed. I like gray characters. I try not to do the classic good and evil because I think all of us have the capacity for good in us and all of us have the capacity for evil in us. Mark Addy: (Robert) is a dark character in many ways, but not just dark. Wearing the crown and the ceremonial clothes for the tournament scenes was the hardest part for me and probably for (Robert Baratheon) as well. He’d rather be down there with the guys drinking and telling stories. Emilia Clarke: Jason (Momoa) is just amazing. An amazing, amazing person. His energy and everything that he brought to the character (of Khal Drogo) was wonderful. It’s quite easy to be scared of him because he’s so big! When I met him it was quite a daunting Danny’esque moment where you’re kind of thinking..oh my goodness...! But his charm, his kindness kind of won me over. Sean Bean: (Stark) is a very principled, very loyal and true to his king and realm. He’s a good man trying to keep his head above water in the midst of all this corruption and treachery. He stands out and that’s ultimately his downfall. He’s split between his family and having to deal with these people who are backstabbers and corrupt. It was an interesting journey for me.